Santa Fe has some truly charming older motels. At one time they must have been a fair distance outside of the city, but over the past few decades the city has encompassed them. We chose the Silver Saddle – by far one of the cutest hotels I have stayed at ever, and even better because it was only $45 a night. Plastered walls, a cotton quilt, and a beautifully tiled bathtub gave it all the charm I needed. Add a balcony and it would have been perfect. Oh, and I almost forgot, there is a margarita haven right around the corner. 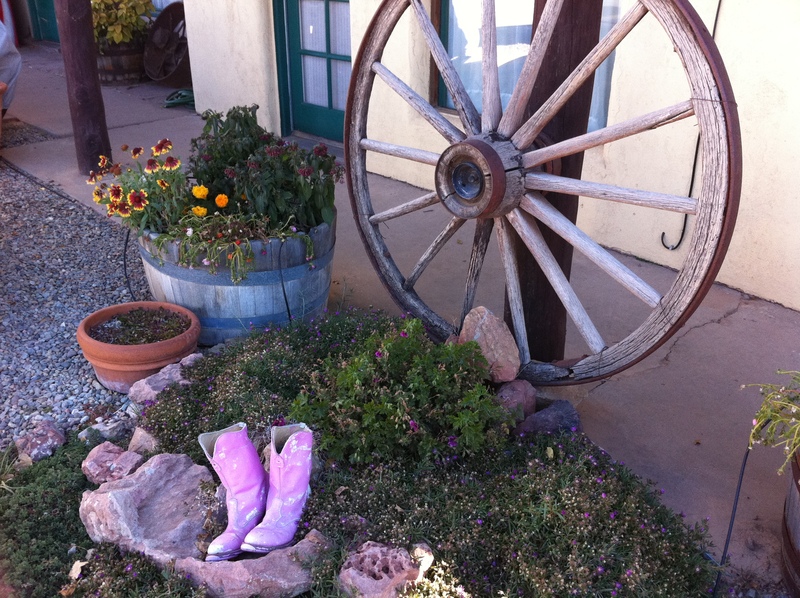 At the Silver Saddle - In case you forget to bring your cowgirl boots, just borrow the pair by the front desk! A couple locals had directed us to Maria’s for dinner. They mentioned that Maria’s had good margaritas if we were interested, but they left out the small fact that they offer 100 different types of margaritas — and I always thought a margarita was a boring, unchanging drink. From the outside the place looks deceptively small, but when you walk in, you’ll be greeted by a meandering collection of never ending rooms. Not to worry, margaritas are on the menu no matter where you end up sitting.